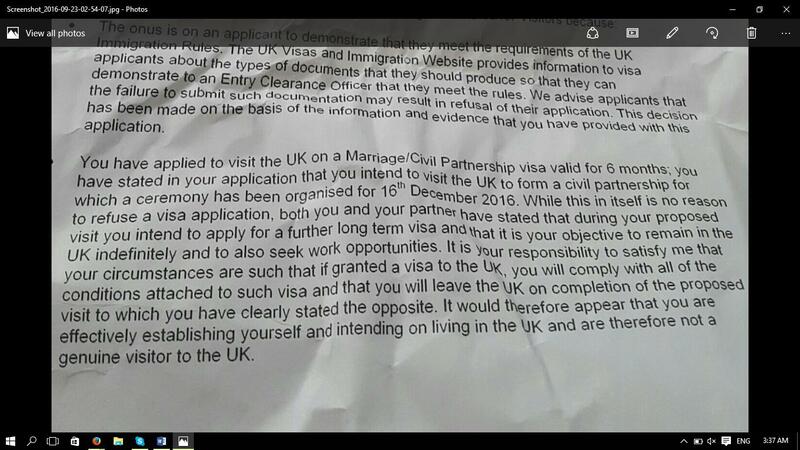 I just want to ask some questions regarding my visa application for civil partnership visit visa but it was refused. The onus is on an applicant to demonstrate that they meet the requirements of the UK Immigration Rules. The UK Visas and Immigration Website provides information to visa applicants about the types of documents that they should produce so that they can demonstrate to an Entry Clearance Officer that they meet the rules. We advise applications that the failure to submit such documentation may result in refusal of their application. This decision has been made on the basis of the information and evidence that you have provided with the application. You have applied to visit the UK on a Marriage/Civil Partnership visa valid for 6 months; you have stated in your application that you intend to visit the UK to form a civil partnership for which a ceremony has been organised for 16th December 2016. While this in itself is no reason to refuse a visa application, both you and your partner have stated that during your proposed visit you intend to apply for a further long term visa and that it is your objective to remain in the UK indefinitely and to also seek work opportunities. It is your responsibility to satisfy me that your circumstances are such that if granted a visa to the UK, you will comply with all of the conditions attached to such visa and that you will leave the UK on completion of the proposed visit to which you have clearly stated the opposite. It would therefore appear that you are effectively establishing yourself and intending on living in the UK and are therefore not a genuine visitor to the UK. Both your application and the supporting letter you have provided from your partner clearly state that once you have formed your civil partnership you intend to seek work via way of nursing school skills you have acquired in your home country. This is not permissible under the UK Immigration Rules as they prohibit a visitor from undertaking employment, whether paid or unpaid, or providing goods or services while in the UK. In light of the statements made in support of your application, I am not satisfied that you will not be employed or providing services. Based on the evidence provided, I am further led to doubt that you will leave the UK at the end of your proposed visit. 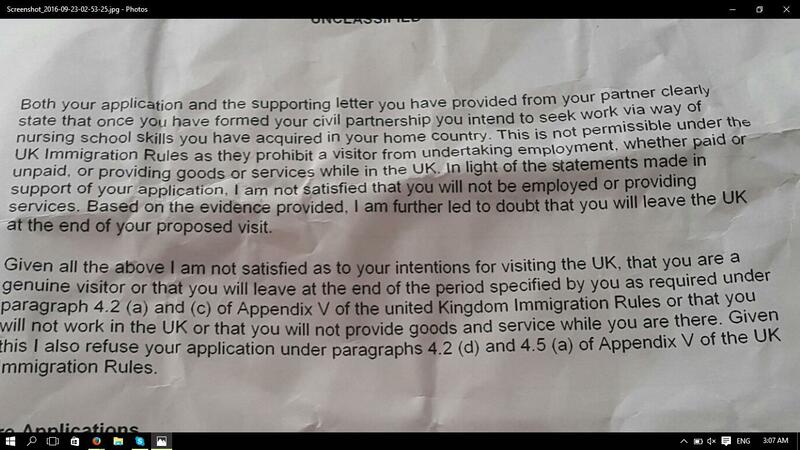 Given all the above I am not satisfied as to your intentions for visiting the UK, that you are a genuine visitor or that you will leave at the end of the period specified by you as required under paragraph 4.2 (a) and (c) of Appendix V of the united Kingdom Immigration Rules or that you will not work in the UK or that you will not provide goods and service while you are there. Given this I also refuse your application under paragraphs 4.2 (d) and 4.5 (a) of Appendix V of the UK Immigration Rules. passport copy of my partner and stamped page of his passport to prove that he was here in the Philippines. The ECO said that I intend to work during my stay which was I did not mention, I know it is a visit visa but my partner said in his invitation letter he is planning to help me apply for further visa which is for settlement and entitles me to work. Can someone advise me on how to do? I reapply again with the docs I submitted together with my copy of payslip, certificate of employment stating my salary, position and years of service and my leave of absence and the certificate of enrolment which I forgot to put a leave of absence (would it be ok? ), study load, copy of school ID. will I convince the ECO this time that I will return to my country after the ceremony? about the certificate of enrolment, would it be okey that there's no leave of absence indicated? how long will I wait for the result? Actually, I already visited the UK last April 2016 for 6 months tourist visa and I apply for civil partnership visit visa last August 9, 2016 and was refused last August 19 I reapplied last Sep 7, 2016 would it be ok? Thanks for uploading your refusal notice. You have applied for a marriage visitor visa which is a type of visitor and falls under this group's charter. You also have the option to post on Expats because your intentions are to settle in the UK. At the moment you are having post-submission anxiety because you have a previous refusal for the same visa type. People get this syndrome when their application is in the pipeline and they are awaiting a decision. But once they deduct the fee from your account, there's nothing to be done until they reach a decision. It means you have to brass it out. Your previous refusal doesn't look that great. Essentially you told them flat out that you plan to violate the terms of your visa; it's hard to know what you were thinking. You told them you want to make an in-country switch to a spouse visa but this is so against the rules that even the suggestion of it gets them upset. The only type of marriage visa that allows for an in-country switch is the fiance visa. Presumably you are opting for a visitor visa because it's so much cheaper and gets you into the UK without going through the financial hurdles that family formation entails; or in short, it's a type of deceit. They get upset when this happens and they stay upset for a long time. Take note that they are now refusing British citizenship (i.e., British passports) to people who have used this strategy. It leaves the person in a state of limbo until they can claim long-term residence (20 years). Lots of people find the financial hurdles in Appendix FM daunting and try to find another way to be together in the UK, even if it's illegal. If their decision on your current application is regressive, you can search for a professional at ILPA. According to their statistics, they should get something back to you by the end of next week. Not the answer you're looking for? Browse other questions tagged visas uk visa-refusals application-status weddings or ask your own question.